Charger Electric Bicycles, E-Bike kits, and More!. We're testing various new chemistries to determine their feasibility for e-bikes and other EV applications. The weight of Lithium-Ion is about a third that of lead acid, offering a value that can't be measured in dollars and cents. If you need the range, these offer as much as three times the range of a lead pack weighing the same. High output, low weight, long range, long lasting. Though the $400 price tag for this pack may appear high at first (incl. 2 Amp charger)...besides the lighter weight, consider they can be charged 3-4 times more cycles as is possible with the average lead acid batteries. The deep cycle lead acid battery's charge capacity begins to taper down after 150 to 200 "discharge to 20%, charge back to 100%" cycles. I.E., lead acid begins to store less and less about half way through their cycle life. Inferior lead batteries, or emergency lighting / UPS type not designed to frequently discharge to 20%...these will begin to provide less range much sooner. Lithium batteries maintain full range until reaching "spent status". A drawback of Li-Ion appears to be a shelf life, regardless of whether the battery is used...due to oxidation. This means resisting deals on dated stock. As of November '03, we were fortunate not to have experienced fires when charging these, as Lee Iacocca's company did with their folding e-bikes using lithium-ion battery chemistry. We found the charging circuitry adequately protected against failure, but were unable to pull too much current under loads without one or more cells failing. These tests resulted in significant expense, and we determined Li-Ion only to be suitable for lower power motors pulling 15 or so Amps. More powerfull motor systems are allowed here in the USA, and until a more robust battery with built-in protective circuitry against high drain is offered, we won't consider the Li-Ion. One manufacturer promised that it's possible to pull over 20 Amps from the 11Ah cells, promising the protective circuitry. We're still waiting as of 11-03. At long last, the Nickel Zinc batteries are shipping in various sizes! 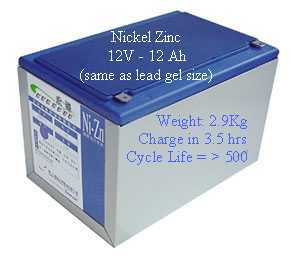 This 12V 12Ah size is the same as the popular sealed lead acid type of the same Ah. rating. But though these are two thirds the weight and expected to last twice as many charge cycles as the lead type, we still haven't conducted sufficent testing to feel comfortable selling them. As availability improves and price comes down, we hope the bike size will perform as it should. It's our belief Evercel may be focussing on the more profitable larger size for heavier vehicles...making bike size a low priority. 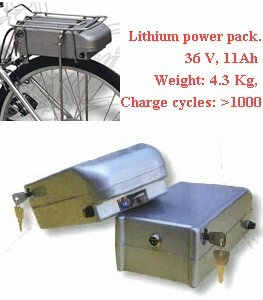 Costing less than Lithium Ion or Nickel Metal Hydride, Nickel Zinc will allow higher amp hours required by e-trikes, e-wheelchairs, e-motorbikes, e-scooters, golf cart type NEVs (Neighborhood Electric Vehicles), and larger electric vehicles requiring more range or less weight than lead acid allows. But...we MUST test samples in "Real World" settings to verify the manufacturer's claims! We believe it's only fair our customers get what they pay for in these tough economic times! We trust that these batteries will be available soon...at fair prices! Eventually premium batteries will be capable of doubling or even tripling the range of lead batteries in e-cars. The range advantage will be the same for pedal assisted "light electric vehicles" (LEV's). A breakthrough by Maxwell Tech. to lower the cost of manufacturing ultra-capacitors could eventually double the range for all battery chemistries used in EVs. Small fuel cell generators powered by hydrogen stored in ethanol, developed by Mechanical Technologies, ...or generators by DCH Technologies, powered by hydrogen stored in canisters (or metal hydride "hydrogen storage tanks" by Energy Conversion Devices)...all exciting developments to extend e-bike range to well over 100 miles! Though these new EV developments are well on their way, we should ask if the extra expense and complexity to achieve extra range or slightly less overall vehicle weight is truly justified... How many of us need a battery range of over 30 miles on our bikes...especially when we can charge up at work or rest stops for additional range? The CHARGER bike's batteries charge to 80% capacity in just an hour, providing 20 or more extra miles after a nice lunch stop! So why wait for the expensive "second generation" batteries and e-bikes when you can buy a legendary Charger offering fantastic value and function today! These great bikes cost only a couple of hundred more than some are paying for an experimental Lithium battery pack alone! You'll have the best e-bike made to date, and you can upgrade it as premium battery prices come down...if you think you'll need a bit less overall weight, (or extra range). It's a great way to get started in the "EV-olution"...or should we say, "EV-Rev-olution"! Super Charger Accessory...add seven more speeds! e-bikes with front hub motors. --CALIFORNIA MOTOR VEHICLE PROJECTIONS FOR 2020...scary !!! SO WHY CAN'T WE ?? ?